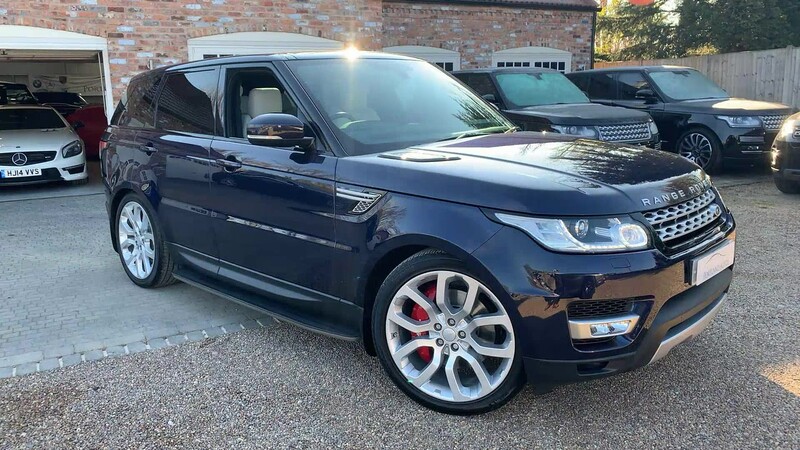 ONE PRIVATE OWNER FROM NEW 2015 15 RANGE ROVER SPORT 3.0 SDV6 HSE IN LOIRE BLUE METALLIC WITH CIRRUS LEATHER INTERIOR. THIS CAR COMES WITH A FULL LAND ROVER SERVICE HISTORY AND THE BALANCE OF THE 5/50,000 MILE YEAR SERVICE PACKAGE. SPECIFICATION INCLUDES FIXED PANORAMIC GLASS SUNROOF, 22 INCH Y SPOKE ALLOYS, FIXED SIDE STEPS, FRONT AND REAR MUDFLAPS, PRIVACY GLASS, GARAGE DOOR OPENER, FULL SIZE SPARE WHEEL, UPGRADED MERIDIAN SOUND SYSTEM, ELECTRIC ADJUSTABLE MEMORY SEATS, HEATED FRONT AND REAR SEATS, SATELITTE NAVIGATION, BLUETOOTH AUDIO STREAMING, CRUISE CONTROL, DAB DIGITAL RADIO, ELECTRIC POWERED BOOTLID, KEYLESS ENTRY. THIS CAR HAS A FULL LAND ROVER SERVICE HISTORY WITH A TOTAL OF 3 SERVICES WITH THE NEXT 2 SERVICES AS PART OF THE SERVICE PACKAGE. 2xKEYS, HPI CLEAR, FINANCE AVAILABLE, PART EXCHANGE WELCOME, TO VIEW UP TO 40 HD PHOTOS AND A HD VIDEO OF THIS VEHICLE PLEASE VISIT OUR WEBSITE.